That dreaded 26th of May in the Ukrainian capital. A ponytailed man kitted up in black, tears rolling down his eyes, arms held up in apology to the many red-clad, deeply saddened Liverpool fans in the stands of the Olimpiyskiy Stadium in Kyiv - remorse for having cost them a special night. More so, it was regret that Loris Karius, on the biggest night of his career yet, had the biggest stinker of his career. Fast forward to seven months later - the Reds had their fate in the Champions League hanging by a thread. They needed to beat Napoli - and circumstances could've meant that even that might not have been enough. Mo Salah gave the Reds the lead - 1-0 would be enough, whatever the circumstances. Then, they missed chance after chance after chance. Last year, in the final group game - the Reds had their no.10 to thank after a Philippe Coutinho hat-trick put them on their way to a 7-0 win over Spartak Moscow. Last night, the Reds' faithful were tearing their hair out, thanks to their no.10 - as Sadio Mane's profligacy meant the game was still alive. It was still 1-0 as we headed into injury time at a rather nervy Anfield. It's what Manchester United fans have grown used to calling Fergie Time. It was, as Sir Alex Ferguson once famously said, squeaky bum time. A rushed clearance from Fabinho gave the ball straight to Napoli. It came back at Liverpool, Dejan Lovren skewed his clearance for a throw-in, then Napoli worked it across the pitch to Jose Callejon on the right flank. His ball into the box soared over the head of Virgil van Dijk - who had been a rock at the back for Liverpool. Fabinho should've had a routine headed clearance, instead he let the ball graze his head and fall to Arkadiusz Milik. Lovren lost his man, as he watched and admired the flight of the ball instead of staying close to Milik. Barely a few yards away from goal, Milik had the ball at his feet, a clear sight at goal, and the opportunity to drive a dagger through Red hearts and for once, ensure that there would be no talk of those famous European nights at Anfield. And really, the Pole did everything he should - got it out of his feet quickly, and got a clean strike at goal. Little did he know that it was time for the second-most expensive goalkeeper to say no to any hopes he had. Alisson Becker spread himself, made himself the size of the Kyiv turf that Karius wanted to be swallowed in. Milik's strike hit Alisson somewhere, he really doesn't care where as long as it stayed out of the net. 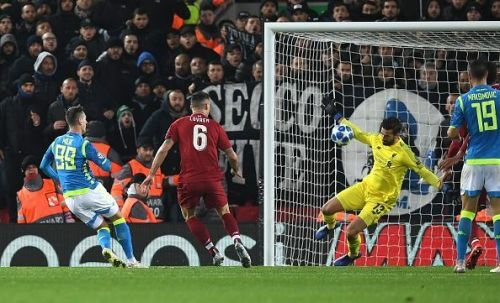 An acrobatic clearance and a Kalidou Koulibaly offside later, Alisson knew he had kept Liverpool in the game, he had kept Liverpool in the Champions League. As he lay prone on the floor having copped a blow from Koulibaly, there they all came. A rub to the belly from Van Dijk, a primal roar and smash of the hands from Andy Robertson, a pump of the fist from his manager on the sideline - the man with whom he celebrated a derby win at the centre circle barely a week ago. Touche, Jurgen, touche! He is the second most expensive goalkeeper in the world, that fee was scoffed at. Goalkeepers can't impact seasons so much to command that kind of a fee, they said. Well, guess what, Alisson was insulted by that. He has made it his personal mission to prove that goalkeepers have big impacts on their teams' seasons. 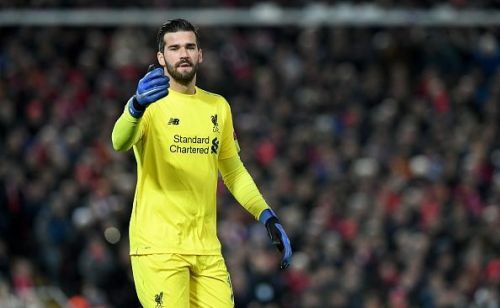 Rewind to just last week, and Alisson was instrumental in not one, but two Premier League games, as the Reds eked out six points from two games where they weren't at their best. Ask Andre Gomes, ask Theo Walcott, ask Ben Mee, they'll tell you. Is he a bargain? Well, that's subjective to what you define as one. Is he worth the investment that Klopp decided to make in him? Behave! From a goalkeeper costing them on their big night in Kyiv in May to their goalkeeper keeping them from the ignominy of a group-stage exit in December, Liverpool have come a long way. The Liverpool defence has come a long way. In 22 appearances this season, Alisson has conceded 13. He has 12 clean sheets. Twelve. He's clutch. Liverpool FC - the players, the staff, the fans - are all infatuated. They're all in love with Alisson Ramses Becker.